Paracelsus (c. 1493-1541) was an alchemist, physician and philosopher who suggested in order to correctly diagnose an illness one would have to examine the patient. 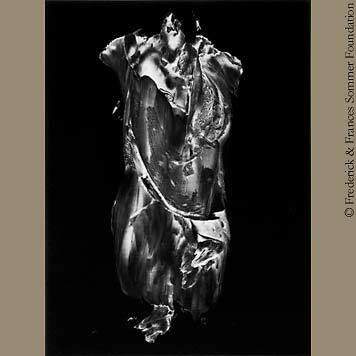 Frederick Sommer's photograph was made from a paint on cellophane negative created in 1959. Slightly pigmented transparent medium was applied to a ~ 3 x 4 inch piece of clear cellophane, in quick moves and then manipulated (prodded and peeled) as it dried and the viscosity changed. To support spontaneity and keep from getting too attached or fussy, paint on cellophane negatives were produced 10-20 at a time. This photograph invokes analogies to classical sculptural fragments and appears to some viewers to reveal the inner workings of the human torso. Two excellent websites about Paracelsus at: National Library of Medicine and Wikipedia.